Bob and I stopped work a bit early and drove to Richmond Park to walk in the Isabella Plantation, a large enclosed garden within the park. The first time I ever saw the Isabella Plantation in springtime, someone had tipped me off that I shouldn’t miss the sight of it with the azaleas in full bloom. But I was unprepared for the effect of that blaze of beauty. Great banks of white, pale pink, dusky pink, lilac, flame red and purple azaleas lined the little rivers and blossomed in all the groves. Magnolia trees, camellias and rhododendrons towered over them. It isn’t like that every year; for some years now, the blossoming of the various shrubs and trees has been staggered, so we never see them all out at once. However, this year there was a unanimous outburst of colour. It was, as a passing photographer remarked to us, ‘almost too much’. 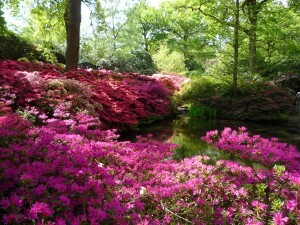 You sometimes hear of people being ‘hushed by beauty’ and this was certainly the case in the Isabella Plantation. Strangers were smiling at one another as they passed, and there was a happy murmur of appreciation at its most intense by the so-called Still Pool, a dark pond whose waters reflected the fiery display of pinks and purples all around it. People were standing there as if mesmerised. ‘This is England?’ someone said. A little Scottie dog came bursting through the rapt admirers and plunged noisily into the pool, breaking up the deep reflections.